Usually this is Wordless Wednesday…. but today it is Back-to-Words Wednesday because I took a few days off from the 59 Word Project… But I’m back now. 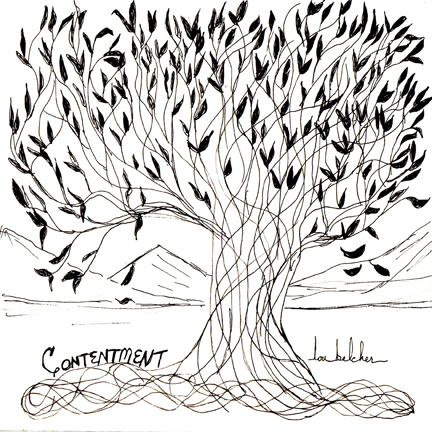 This is named Contentment1 because there will be a Contentment2 soon. You see, our friends at Katnip Lounge submitted contentment also, and I know that their idea of contentment is probably not mountains and trees…. Anyway, you all may find a nap under this tree will bring you contentment, but I named it for an entirely different reason. I was cleaning off my work table yesterday, and I found a pen that writes like a dream. I couldn’t put it down. In fact, I found total contentment in using it for some black and white drawings yesterday. So, I decided to do a pen and ink drawing for today’s word. This entry was posted in art and tagged 59 Words, contentment. Bookmark the permalink. Simply lovely. Have a wonderful Wednesday. WE would be CONTENT to lay under that tree on a hot summer day. Beautiful! It would have been a pawesome Earth Day drawing too! I love this drawing – there’s something so calming about the composition. This drawing really does evoke feelings of contentment! As Sparkle wrote … the composition is quite calming. That is just terrific. That sure looks like contentment to us. We like your drawing. Take care.